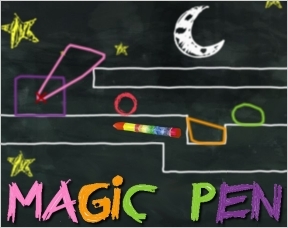 Magic Pen is a physics-based puzzle playground created by Alejandro Guillen (Spin the Black Circle). It's easy to see the design, from visual style to overall concept, was taken from Crayon Physics, but because Magic Pen is a Flash game, it's much more accessible. Using the mouse, simply draw shapes to create bridges and guide the red ball to the flag. Making shapes and dropping them from the sky will set the ball in motion, and you can also craft structures with hinges (both fixed and movable) for more complex maneuvers. The shapes you draw are affected by three basic principles: gravity, friction, and inertia. In other words, common sense physics. Drawn shapes will fall to the ground, bump against each other, and sit still unless acted upon by another moving shape. You can draw just about any object you please, but Magic Pen automatically smooths out jagged edges into a more block-like shape. The entire game is mouse-driven, all you have to do is click and start drawing. Pins and hinges link objects together and allow you to craft more complex machinery to get the ball to the goal. Hold the [S] key and click inside an object to draw a pin, then draw a second object that overlaps the "X" and it will be held in place. For a movable hinge, press and hold the [D] key and start drawing. The shape you create will be affected by gravity and slowly swing around the pivot point towards the bottom of the screen. There are over two dozen levels in Magic Pen, each one more wickedly devious than the last. There's even a sandbox mode accessible from the in-game menu (press [Q]). The number of shapes you used to complete each puzzle is recorded, and once you beat the game you can submit your scores to see how well you did compared to other Magic Penners. Analysis: Good-looking, simple, engaging and fun, Magic Pen is exactly what I like to see in a casual online title. The game doesn't try to hide the fact that it's a near-direct clone of Crayon Physics; Alejandro even thanks Petri Purho in the credits. One key difference is you can't do "shape bumping", or drawing overlapping objects so they pop on top of each other. And when Crayon Physics Deluxe is finally released, it will no doubt contain much more content than Magic Pen. Magic Pen takes place in real-time, meaning once you draw a shape it's immediately set into motion. This really keeps you on your toes, but it can also be frustrating when trying to draw delicate platforms in a pinch. A start/stop mechanism would make it much more of a cerebral puzzle game, whereas the current setup feels like an arcade experience. A great Flash experience that's fun as a webtoy and challenging as a puzzle game.